This article appeared in Elements Magazine in 2004. 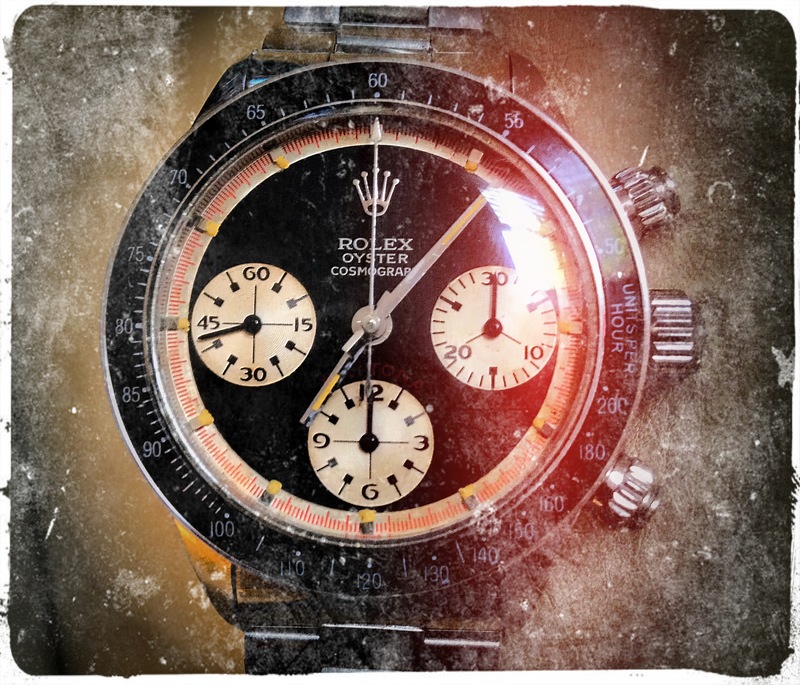 A timepiece can tell a lot about a person: their dreams, ambitions, and desires all carried on a wrist. Even during a boring business meeting, one can look at one’s diving watch and be reminded of a vacation in a tropical paradise. 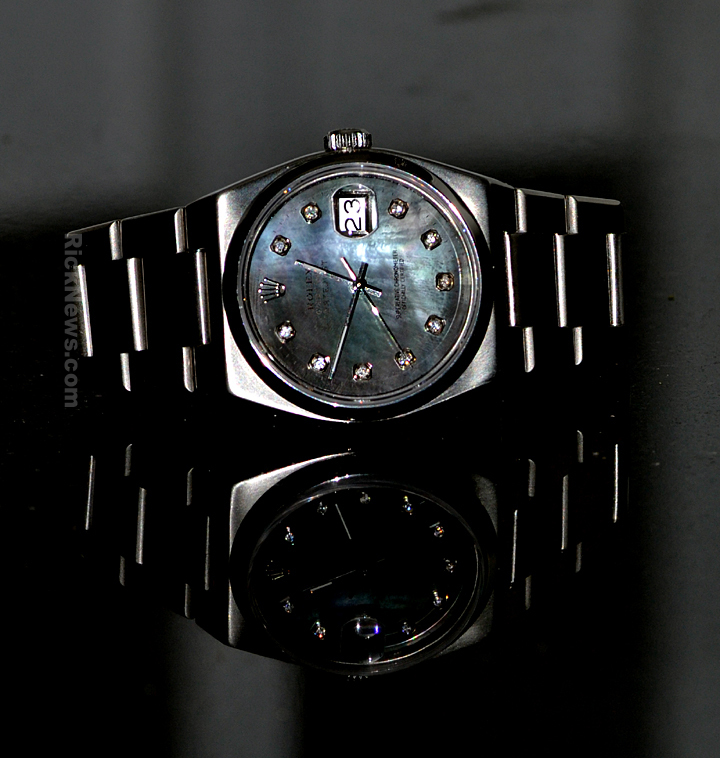 While waiting on a bank line, just a glance at a bejeweled chronometer can cut the tedium like a diamond through glass. Yet, life is more than meetings or chores—it’s about doing, seeing, and enjoying one’s days. Just as one changes one’s clothing to suit different activities, so should a wristwatch reflect the moment. Remember to synch your watch...and open the chute! Rolex's ulitmate "tool" watch, the Sea Dweller. 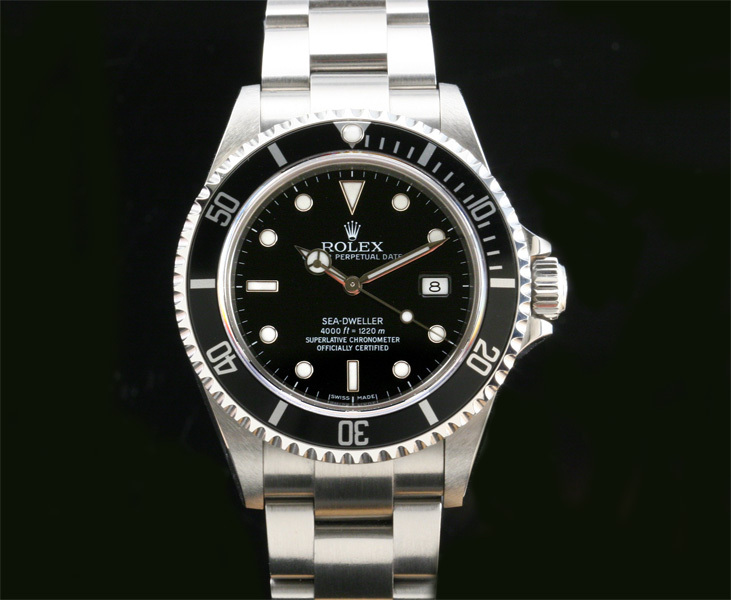 The ultimate men’s diving watch is a Rolex Sea-Dweller 4000 (about $4,400). This is a rare model that comes sans the date magnifier on the crystal, but with a special valve enabling it to withstand decompression. Hewn from a solid chunk of stainless steel, the Sea-Dweller can withstand depths of up to 4,000 feet of the salty brine. Hey, even fish need to see bling sometime. 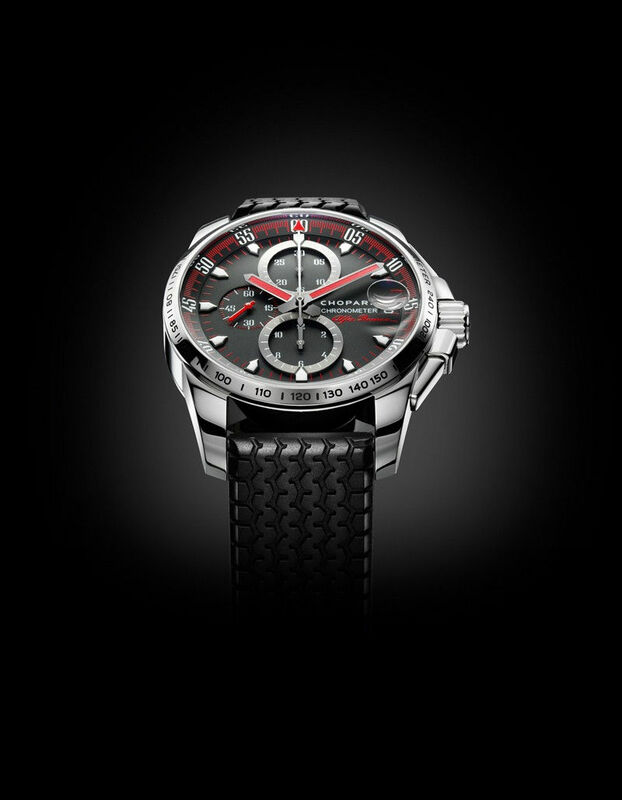 Inspired by a legendary car race, the Chopard has a rubber strap with a Dunlop racing tire pattern. Speed and style have always gone hand-in-hand, and the timepiece that most exemplifies this is the Chopard Mille Miglia chronometer chronograph (starting at approximately $2,500). Crafted of titanium, gold, or stainless steel, the Mille Miglia is named after a famous Italian road race. While the stopwatch function is useful, nothing comes close to the sensation of speed like the Mille Miglia’s 1950s racing tire-inspired rubber band. Why shoot for the stars when your watch costs as much as the moon? Black tie events are a drag: weddings, charity events, or some other affair where you’ll have to part with money. Yet, one should look the role, and the Patek Philippe 18-carat white gold Celestial Watch (about $160,000) looks so good it should receive an Oscar. 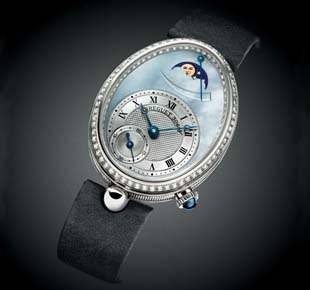 The Celestial features a self-winding movement with a sky chart, plus the phases and orbits of the moon. 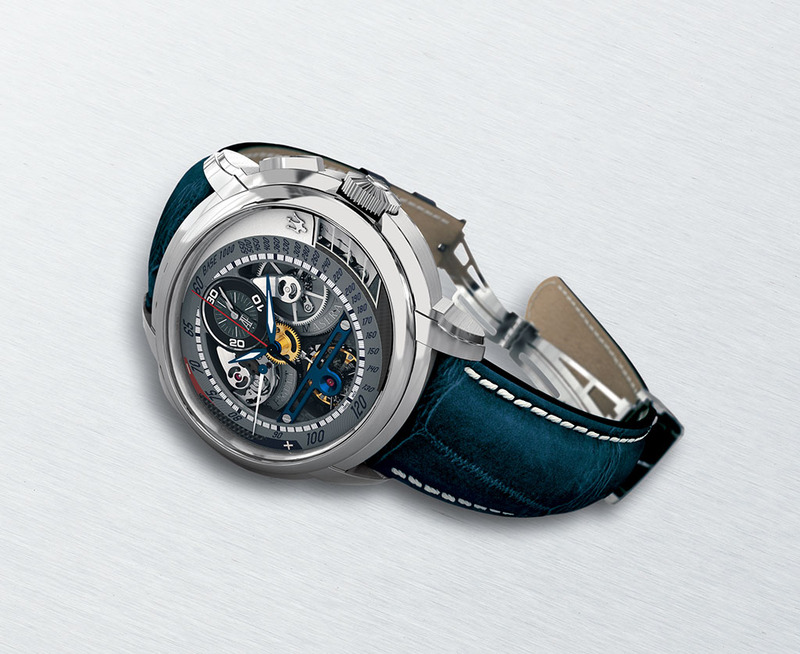 After all, during a lengthy wedding toast or a tribute speech, a gentleman can gaze at the regal blue dial and dream about the heavens—acquiring them, that is. It's fit for a Queen alright--Naples, Italy or Florida. Shot with a Nikon D3100. TAG-Heuer has been involved with the McLaren-Mercedes F1 team for almost two decades and the latest fruit of this relationship is the SLR watch. 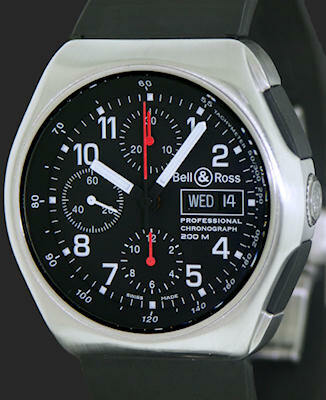 Celebrating the M-B supercar that McLaren built in England, the SLR is notable for its top-mounted chronograph pushers. A unique car befits a unique watch and the TAG-Heuer sure fits that bill. On rubber strapped versions of the SLR, the strap mimics the side air vents of the automobile—hot! Luxury British/German carmaker Bentley has been using Breitling clocks in its automobiles for almost a decade, and the wristwatch line from this partnership has been going strong for just as long. Known mainly for shiny, stainless steel cases and knurled bezel edges that recall a Bentley’s cockpit control switches, the Breitling for Bentley Motors line is just as attention grabbing as its tarmac twin. Large and with presence, both on the road and the wrist. Ferrari, the legendary Formula One team and road car builder, linked with Italian-designed/Swiss-made watchmaker Panerai. The Ferrari Engineered by Panerai collection combines the signature “big case” timepieces of Panerai with the engineering detail of Ferrari, such as the hobnail-textured dials and the cavallino rampante embossed on oversize crowns. Just like the automobiles, these watches can be had in a variety of styles: rose gold, stainless steel, or even a PVD-coated case, which as black as a set of Pirellis. There’s a saying: “The reason why there are $2 million automobiles is because you can’t drive your $20 million house around.” Taking that further, “when one can’t drive their $2 million Bugatti Veyron 16.4 around, they can, however, tote their $200,000 wristwatch around on their arm.” To celebrate the unique engineering and design that went into the French supercar, Parmigian Fleurier designed a unique timepiece whose face is at an almost-90 degree angle to the wearer’s wrist. Winner of the “2006 Watch of the Year,” PF 370s are probably the best way to advertise to the world that you own a 267-mph car…that costs over $2 million. When one thinks of an Aston, images of classic, understated beauty combined with high-tech come to mind. 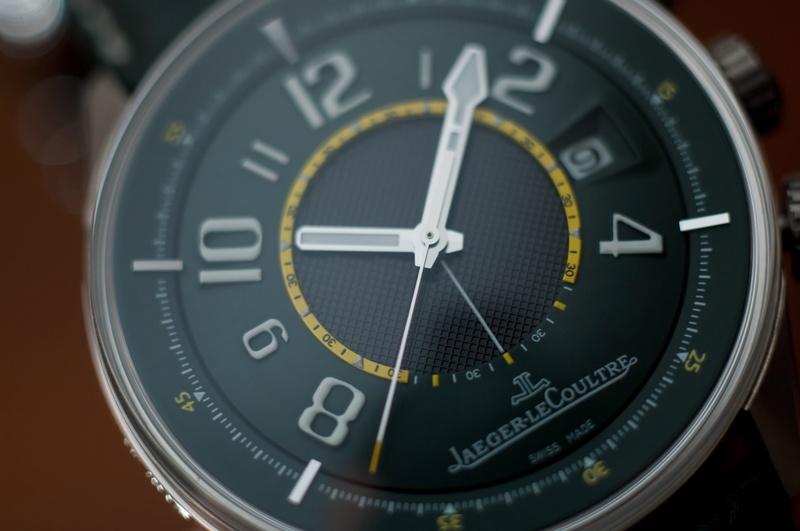 That’s exactly what respected watchmaker Jaeger-LeCoultre captured in their AMVOX editions. No, there are no digital displays on this timepiece, but it does, however, have an alarm. (It’s mechanical, and not battery powered.) 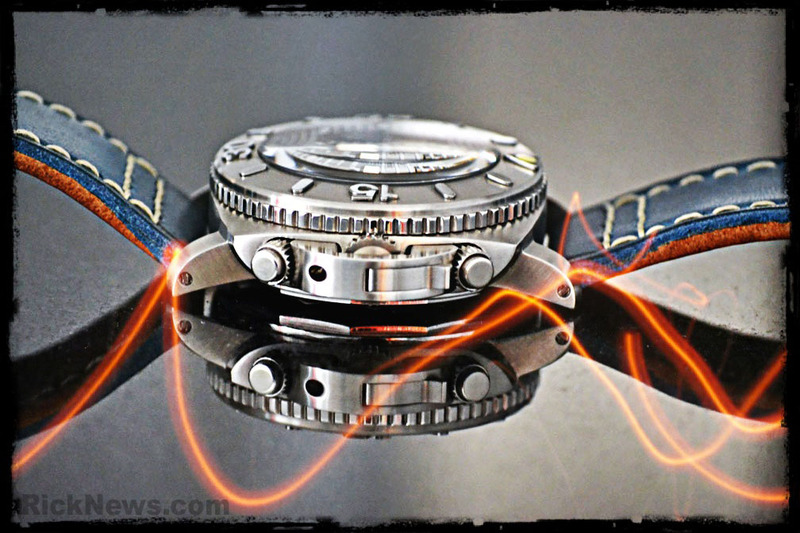 The high-tech is further represented by a titanium case and a “carbon-fiber effect” strap. 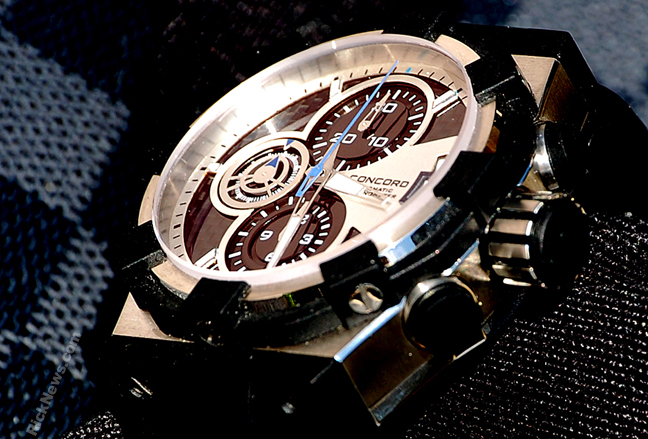 The AMVOX series is also available in other movements, such as a chronograph. It’s too bad “agent 007” sports an Omega, however. “Brash and bold” is how most would describe a Lamborghini. It certainly describes the Gallardos participating in the one-make racing series, the Lamborghini Blancpain Super Trofeo cup. In this Euro-only series, only Gallardos are allowed to play, which means that whoever wins, the victor will be driving a V10-powered screamer! To celebrate, Blancpain debuted their Super Trofeo Chronograph. Far from brash and bold, its case is black DLC and the strap is made of Alcantara suede (the steering wheel cover of choice these days). Blancpain delivers the emotions of “speed” via a bright red chrono start/stop pusher and the numbers “12” and “9” rendered like those on racers. Only 300 of these beauties were made. Audemars Piguet and Italian automaker Maserati teamed for Maser’s 90th birthday and produced the limited-edition Milenary Maserati. Restricted to just 900 examples, this timepiece features an interesting design, where the hours and minutes are displayed on an offset inner dial. At the far left of the face, there’s a power reserve indicator. Meanwhile, a second time zone is displayed near 6 o’clock and the date is near “2.” Naturally this beauty comes in a special presentation box. The brand “Porsche Design” is synonymous with its automotive brother from Stuttgart, in that they’re both known for high-tech, sleekly styled machines that offer a uniquely Teutonic perspective with regards to their form and function. 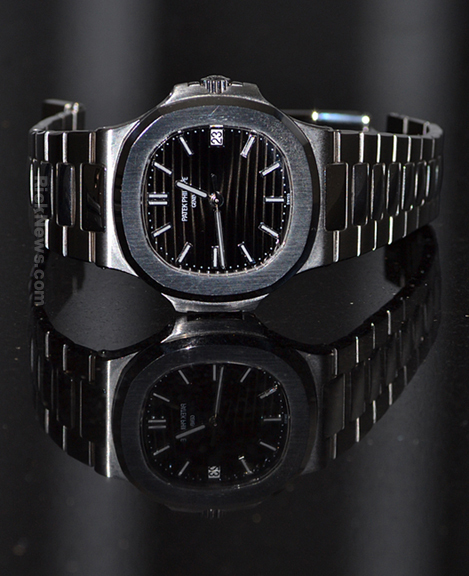 Perhaps no such timepiece from PD (made for them by the Eterna company) represents this better than the P’6780 Diver. Unlike any wristwatch you’ve seen, the entire case lifts up, ostensibly for better viewing when you’re a few hundred feet below. 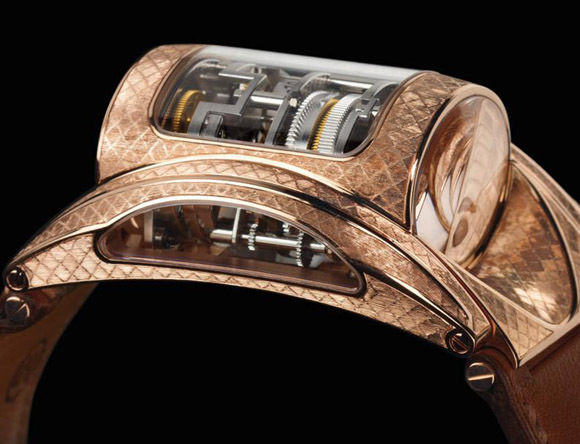 Yet, this contraption isn’t heavy because it’s hewn from titanium, with a natural rubber strap. The perfect watch for when one is at the wheel of a Carrera GT or underwater at the wheel of a 928 (Risky Business fans, that one’s for you).